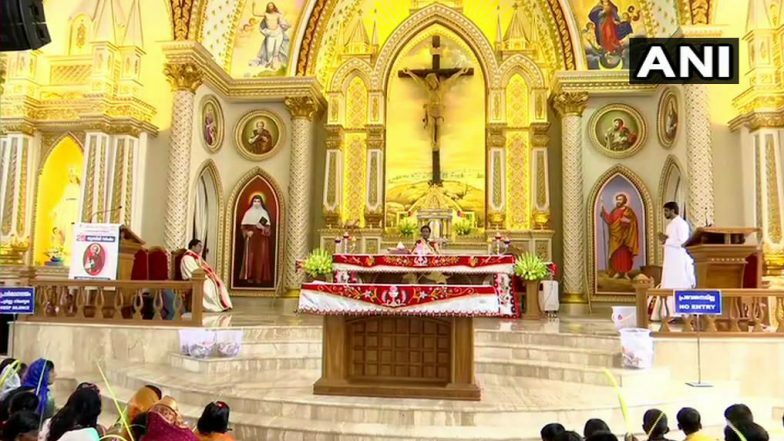 Thiruvananthapuram, April 14: Churches across Kerala on Sunday morning were crowded as a large number of devotees took part in the 'Palm Sunday' service which marks the beginning of 'Passion Week'. From Sunday till Easter Sunday (April 21), special masses would be held every day, with the most important ones on Maundy Thursday (April 18) and Good Friday (April 19). Lent 2019 Calendar With Dates Till Easter: What is Lent? Important Facts About the Christian Holy Season. The service is organised to commemorate Jesus Christ's entry into Jerusalem, when palm branches were placed on his path before his arrest and crucifixion on Good Friday. This event was enacted in several places on the roads when devotees with freshly cut coconut leaves in hands walked doing prayers and singing hymns. Of the 33.4 million people in Kerala, Christians account for 61.41 lakh. Catholics constitute around 50 per cent. Even though most denomination of the Churches have varying duration of observing lent, the Orthodox Church has the longest -- extends to 50 days -- when non-vegetarian food is not consumed while the most devout turn vegan. But even those who are not that devout make sure that starting Sunday and till next Saturday, non-vegetarian dishes are not on their dining tables.